Fantastic news! Westmoreland was the first barge I sailed on with the Thames barge Sailing Club and her loss in 1973 was devastating. The decision not to repair her doubly so! I was lucky enough to sail with Colin on Centaur with his Dad in command and I look forward to Westmoreland being restored – so glad she will not be lost forever. I am so pleased to hear that the Westmoreland is being restored. She holds many memories for me, my Dad and Granddad both sailed and raced her. I will keep an eye on her progress. Thank you to all who are looking after her. Having just found your website, may I say how pleased I am to see the great news about Westmoreland, and also sympathise with all those affected by the Standard Quay disaster. Just more of our countries maritime heritage wiped away for short term financial gain. 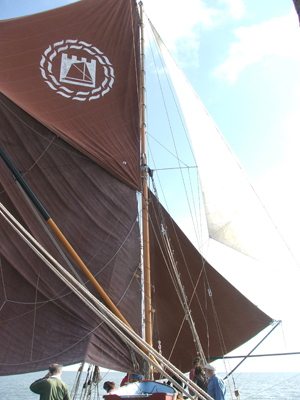 Although I am a retired boatbuilder,(both modern and traditional construction) I have had only a little experience of Thames Sailing Barges. I knew a barge on Wootton Creek on the Isle of Wight, and always admired her although she was de-rigged and used as a houseboat. 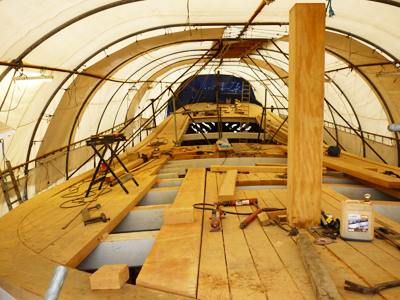 She was still watertight,(as best wooden barges can be) and still had deck gear and fittings, when her owner decided to develop the land she was moored adjacent to and offered me the job of breaking her up. In my humble opinion she was well worth restoring at the time and I refused the job and tried in vain to persuade the owner to dispose of her in a way which might save her. Such was the rush for development profit from waterside plots that the JCB’s which arrived to dig the footings etc took the first couple of weeks destroying and burning the barge. I could have wept. I have tried in vain to glean some history of her, to no avail, and would be grateful if any reader could tell me anything about S.B.HOUND. I wish you good luck with all your projects in the future, and hope one day to visit your area and witness a rare remaining part of our heritage. I remember hearing about Westmorland breaking her back while taking the ground in the 70’s. 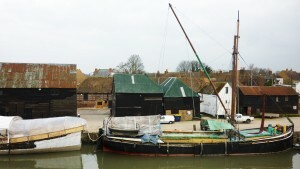 We had seen her a few times while cruising the Essex creeks out of West Mersea as a boy with my family. As I remembered she was a fast barge that showed her stern to most in the barge races. She was a sight to see then. It’s been so long and I have lived in the US since the 80’s but to see the hull in some of the photos as a weather beaten unloved hulk is soul destroying. I think her hull was unusual, for the time, gray and might have been white in some old photos? I’m so glad that such a quality barge has a chance of restoration, Such a shame funds could not be found at the time as the cost now will be 100 fold! rebuilding a good barge will cost the same as a ‘dog’ but in the end you get a great barge…..why rebuild a Cortina when you can rebuild an e-type! I hope Standard Quay can survive in some form looks like a real battle there. The examples I have seen that have gone the marina condo route are awful. The whole reason folks want to move their is gone. But compared to the US east coast you are still in the dark ages so it could be worse! Good luck I’ll try to see how you are doing as time goes on.Thanks for the postings. It’s great to hear the Westmorland is going to get a second lease of life. My first experience at sea was with my grandfather on the Westmorland. As a 12 year old I can vividly remember the run in a north east wind entering the Medway and at some speed. The skipper’s cabin was a warm and welcome place on a winter’s day with the pot belly to keep us warm.